The picture to the left is called a thumbnail. When you click on this small picture, a larger picture will be displayed. You can print the larger picture. To return to this page, just click the "back" button. Hybridizing is best done before noon on a day without rain. Equipment: Tweezers or Q-tips, small cardboard tags, twist ties, pen and notebook. Remove anther from the iris, first check for pollen. Or use Q-tip to extract pollen. This is called the "pollen parent." 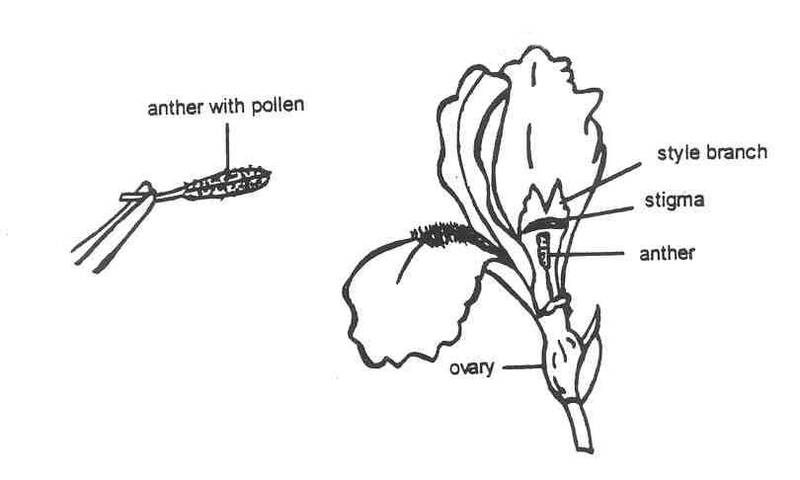 Rub pollen on stigmatic lip (either one or all three) of another freshly opened iris. The stigmatic lip should be moist enough for the pollen to stick. This iris is called the "pod parent." Tag iris. The cross would read Pod Parent x Pollen Parent. Record cross in notebook along with name of person who made the cross. This is called your stud book. Keep these records for a long, long time. Iris blossom will close up and within a few days the ovary underneath will begin to swell if the cross "took." Allow pod to grow on stalk. Observe pod as it continues to grow. Harvest pod in mid summer. It will turn lighter green to tan and begin to split. Don't delay or seeds will spill on ground. Shell out seeds into open container (like coffee filter) and let dry for several weeks. Be sure to keep tag in the container with seeds. Use separate container for each pod. In late fall (mid October in Missouri) plant seeds 1 inch deep and 1 inch apart in open ground or in deep pots sunk at ground level. EACH SEED WILL PRODUCE A NEW IRIS DIFFERENT FROM ALL OTHERS. The following spring seeds will germinate & seedlings may be "lined out' late spring. Handle carefully and barely cover with soil in sunny, well-drained spot. Bloom will occur the second spring, or at least the third. Evaluate seedlings for two bloom seasons or more. Destroy ugly seedlings. Assign numbers to good ones and grow to increase stock. Send to test gardens and tour gardens for evaluation if desired. Choose a name for superior seedlings and send to AIS Registrar. Directions are in the AIS Bulletin. Offer your new iris hybid for sale by advertising it in the AIS Bulletin or other publication. Send a photocopy of the ad to the AIS Registrar. New tall bearded irises sell for $40 per rhizome and up. You are now a "real" hybridizer. New iris varieties are made by cross pollination which results in seeds, each one new and different. Making new iris varieties is done by seed propagation. To keep your iris clumps true to name, break or cut out stalks right after bloom (unless, of course, you have made a cross and there is a seed pod on the stalk). Bumblebes often cross-pollinate irises and pods can go unnoticed. If these seeds fall to the ground, new iris seedlings could bloom in two to three years contaminating your original iris clump.